West Chester’s Roots Cafe offers breakfast cheesesteaks. Sunday, March 24, is National Cheesesteak Day and one West Chester eatery plans on celebrating big. 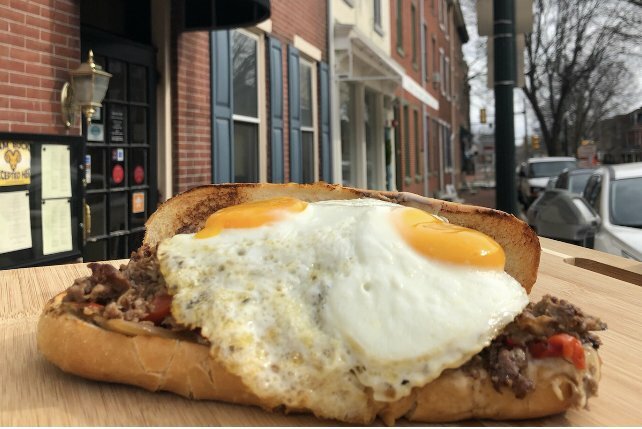 Roots Café will give away "The Antidote," a breakfast cheesesteak with CBD, for free to the first 50 dine-in or takeout customers, beginning at 8 a.m.
Owners John Hearn and Dan Merola called National Cheesesteak Day the "perfect opportunity" to introduce the sandwich to the restaurant's menu. The breakfast cheesesteak ($12) includes seared ribeye steak, ham, sausage, pork roll, bacon, peppers, fried onions, a house-made cheese whiz composed of gruyere, pepperjack, white cheddar and American cheeses, and is topped with two farm-fresh sunny side up eggs. All of that goes on a Sarcone's Bakery roll, with the addition of 5 milligrams of CBD oil. "The sunny side up eggs and CBD oil are optional when we’re not giving them away, but otherwise we aren’t able to make any substitutions or changes to what we feel is a seriously satisfying masterpiece," said Merola. "I'd put this belly filler up against any breakfast sandwich or cheesesteak anywhere," added Hearn. Roots is located in at 133 East Gay Street in West Chester. The restaurant is open Tuesday through Sunday from 8 a.m. to 3 p.m. Thursday through Saturday, Roots is also open for dinner from 6 p.m. to 9:30 p.m.